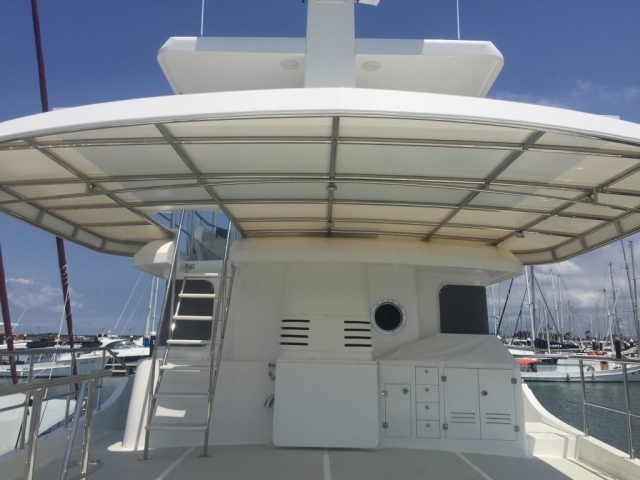 A Hard Top Effect roof to go over the mid Aft deck, that has a solar panel mounting system attached. The client requested that we supply a roof over the Mid-deck that blended with the bridge deck hard top. This roof was not to be a old fashioned lace on job. 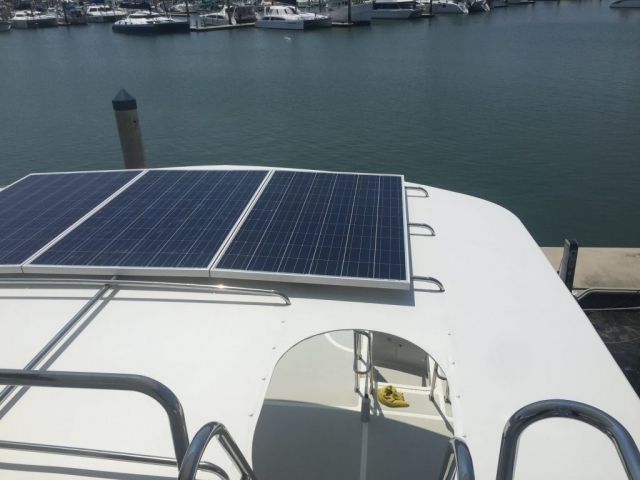 He also required a Solar Panel Mounting system to be attached to the top of the roof. The solar mounting system was to be as low to the soft roof as possible. Stamoid Open was used as we did not want to add any weight to the upper deck. 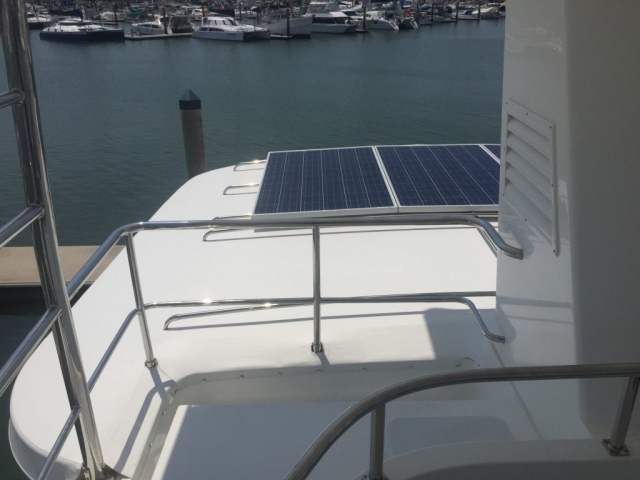 The Solar panel mounting system was installed using my own design of end fittings. Extra frames were also installed for future solar panels to be added by the owner. Tracked to the front then Lockline was used to create an even tension all around the frame with a seem-less look . 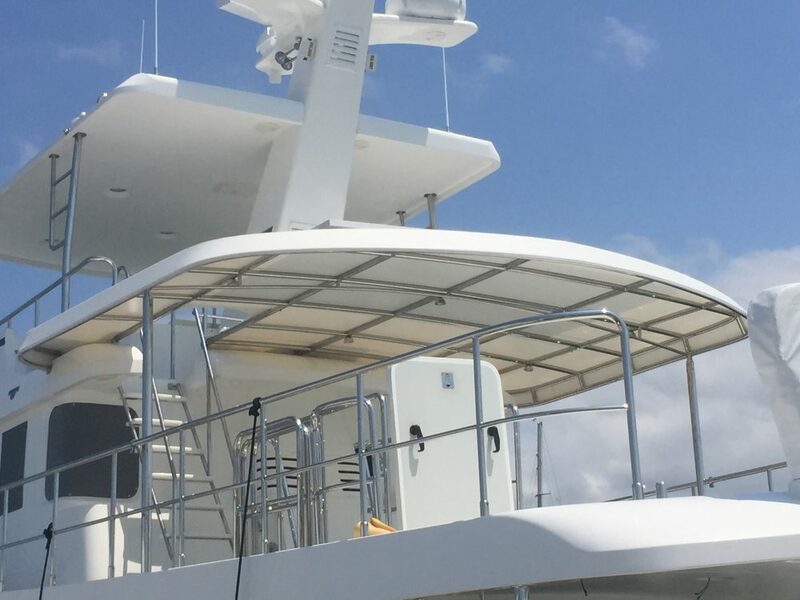 This was a huge roof to pattern and fit all round the bridge deck rails, while keeping it as water proof as possible and then tension it with the Lockline system. Overall, the look of the added roof, matches the existing lines, created by the hard roofs and the lines of the boat. Together with a light-weight roof and solar panels, the additional weight (up high) was kept to a minimum, compared to a full fibreglass roof. It has added another entertaining area to be used by the family.